NEW YORK (CNNMoney.com) -- General Motors, the nation's largest automaker and for decades an icon of American manufacturing, stood on the brink of a bankruptcy filing and a de facto government takeover on Monday. The storied history of GM enters a new chapter as the automaker seeks bankruptcy protection. A bankruptcy petition will be filed at 8 a.m., according to a source with direct knowledge of the bankruptcy proceedings. President Barack Obama will address the nation shortly before noon on Monday to explain the rationale for the filing, and his hopes that this is the best route for a turnaround, two officials close to the situation told CNN. The day "will rank as another historic day for the company -- the end of an old General Motors and the beginning of a new one," the administration stated in documents released Sunday. The rescue of GM is being led by an unlikely coalition of the U.S. and Canadian governments and the company's employees and creditors. The Obama administration will commit another $30 billion on top of the $19.4 billion it has already given GM to cover its losses and fund its operations. The U.S. government will get a 60 percent equity stake in the new company after restructuring, as well as $8.8 billion in debt and preferred stock. A trust established to fund health care benefits for retirees of the United Auto Workers union will own 17.5 percent, and get the right to purchase another 2.5 percent of the company. The governments of Canada and Ontario will lend $9.5 billion and receive 12 percent of the equity in the new GM. Finally, bondholders who lent GM $27 billion will forgo much of what they are owed and instead get a 10 percent share of the new company plus the right to secure another 15 percent. In addition, investors who own 54 percent of those bonds have agreed to not fight plans for a quick bankruptcy. The deal could make it easier for GM to restructure by neutralizing some of the opposition to a bankruptcy filing. But for GM, the bankruptcy filing will be just the beginning of a major overhaul aimed at creating a much smaller company. 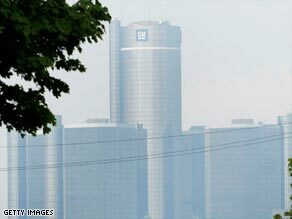 As part of the reorganization, GM is expected to cut 20,000 jobs and close about a dozen plants by the end of 2010. The company has already said it will slash 40 percent of its network of 6,000 retail dealerships by next year and drop four of its brands -- Hummer, Saab, Saturn and Pontiac. The impact of GM's bankruptcy, which follows a Chapter 11 filing by Chrysler on April 30, will ripple across the nation to dealers, suppliers and other businesses large and small that work in the sector. The company, once the country's largest private-sector employer, has only a fraction of its former staff. Its 80,000 hourly and salaried U.S. employees are half the number it had as recently as 2001. Nearly 500,000 U.S. retirees, as well as more than 150,000 of their family members, depend on GM health insurance and pension plans. Retirees will see cuts in their health care coverage, although the company's underfunded pension plans are not expected to be affected by a bankruptcy filing. In addition, some 300,000 employees at GM dealerships will be affected, as well as hundreds of thousands of workers at auto parts makers and other GM suppliers whose jobs depend on the company's survival. The government takeover -- even one that aims to be temporary -- marks a dramatic turn for century-old GM, which has been brought to a whisper of insolvency by plummeting auto sales and huge losses. General Motors has reported losses of more than $90 billion since 2005, while its share of the U.S. market has dropped to 19 percent from more than 40 percent in 1980. The company and Treasury Department officials, under the direction of Obama, have been negotiating for weeks with creditors and the UAW. But months of complicated talks and court fights remain. While most of the company's major bondholders have agreed to drop their fight in return for the stake in the company, many small bondholders vowed to fight the reorganization plan, arguing they deserved a larger stake in the company. They argued that Treasury and the union trust fund got too large a stake in the company given their losses. But it is likely that GM's stock will not be publicly traded for at least six to 18 months. Current GM stockholders will see their holdings in the company completely wiped out by the bankruptcy filing. GM stock closed trading Friday at 75 cents a share. Adjusted for stock splits, it marked the first time the stock finished at that level since 1932. Taxpayers would make back the money loaned to GM if shares of the new company increase dramatically in value someday following a successful bankruptcy. A senior administration official said Sunday that the government is only taking a majority stake in order to try to recapture some of the money that is being provided to GM -- and not to exert control over the company or make decisions on what cars to make or how to make them. "It is not something we sought or desired. It's a necessary outcome," he said. The government would try to get back as much money as possible but would also sell its stake as soon as possible, the official said. "There's a natural tension between those two goals." Many experts have questioned whether the government will be able to recapture its investment in the next few years. GM will still be contending with weak demand for autos and competition from much stronger rivals such as Toyota Motor and Ford Motor. Administration officials said they would not be making decisions about directors, although they will be consulted about new board members. Chief Executive Fritz Henderson, who got the job earlier this year when the government forced Rick Wagoner out of the top job, is expected to stay in place, according to an administration official. Several administration officials said they believe this latest cash infusion will be enough to see the company back to once again being a competitive company, although they would not rule out additional help if the company continued to struggle. CNN Senior White House Correspondent Ed Henry and White House producer Xuan Thai contributed to this report.